Everyone knows that little kids love to wake up bright and early on Christmas morning so that they can dive right into the presents, while the adults just wish they could sleep in, am I right? What if there were something that would make us grown-ups want to get right out of bed early on Christmas morning and come clambering down the steps like excited rugrats too? If there’s anything that can do it, I’d say it be food. And in the personal case of THIS adult, (short of, I don’t know loan forgiveness or a winning Powerball lottery ticket) then I’d think more specifically, it would be the smell and anticipation of a good Christmas breakfast. I’ve had some of the shortest sleeps of my life the night before I know I’m going to eat good the next day. At times, it really can be like being a little kid struggling to go to sleep on Christmas Eve. I’ve put roasts in the slow cooker late at night, then absolutely woken up bright and early the next morning, rushed into the kitchen and lifted the lid just because the smells coming out of it were too tantalizing to leave alone and I had to see/taste the results. The smell of them is a very close second to the taste. To me, the smell of baking pastries is just how you’d imagine Christmas morning would smell if you could capture it inside an air freshener. It makes me kinda curious as to why no one’s gotten on that yet; surely some company out there must be able to do better than those sugar cookie flavored candles that really just act as triggers for your gag reflex. You know what smell would make an *awesome* holiday candle? The presents underneath the tree are always going to be what gets the kids out of bed–but I promise one thing and it’s that the smell of these buns baking in your oven will prooooobably be enough to make the adults curious enough to at least wake up and call out what’s for breakfast. It’s just…glorious, you guys. The dough is both all purpose and whole wheat based, which gives it a faint nuttiness that pairs very well with the nutmeg that I added to give it an earthy spice. For shaping, I couldn’t make my mind up between wreaths and spirals, so I did both. The spirals proofed and baked prettier than the wreaths and in the future I’d probably just stick to the spirals, but you can shape these into whatsoever shape your heart desires; heck, you could even just leave them as simple balls of dough if you’d like. It won’t affect the taste, promise. Aside from it’s awesome flavor, you can probably guess that the best part of biting in one of these babies is that crunchy layer of demerara sugar that sprinkled on top. Because it’s sprinkled on before baking, it also becomes caramelized in the oven, giving an even richer, sweeter flavor to the buns overall. I know I don’t need to state the obvious, but I will anyway: these are delicious. Slice one in half when piping hot, slather with butter and jam and you’ll swear it’s a Christmas miracle. Whisk yeast, milk, and maple syrup in the bowl of a stand mixer just to combine. Sprinkle the 1 teaspoon of white sugar on top then let sit until foamy, about 10 minutes. Whisk in eggs and the 6 tablespoons of butter. In a small bowl, combine the salt, whole wheat flour, 2¾ cups all-purpose flour, and nutmeg. Gradually add the flour mixture to the mixer and mix on low speed with dough hook until a shaggy dough forms. Increase speed to medium and mix until dough comes together into a smooth ball and pulls away from the sides of bowl, 10–12 minutes. Place dough in a buttered large bowl and cover. Let sit in a warm spot until doubled in size, 1–1½ hours. Meanwhile in a small bowl combine the 1/3 cup of demerara sugar with the 1/3 cup white sugar in a small bowl. Punch down dough and turn out onto a lightly floured surface; divide into 3 pieces. Working with 1 piece at a time and keeping the other pieces covered in plastic wrap, roll out dough into about a 12 x 8″ rectangle. Sprinkle with one-third of sugar mixture and cut crosswise into 4 pieces (you should have four 8 x 3″ rectangles). Roll up each piece to make a long rope; squeeze ends gently and pinch along seam to seal. Tug rope to stretch so it’s about 10″ long. From here, either roll the ropes up into coils (like you would a spring), or shape into wreaths (there are MANY tutorials online that will show you how to do this). 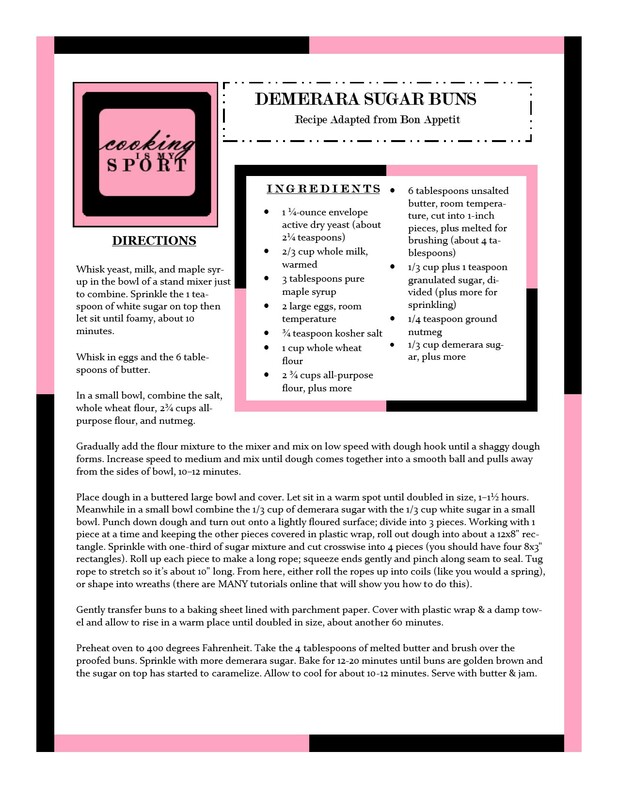 Gently transfer buns to a baking sheet lined with parchment paper. Cover with plastic wrap & a damp towel and allow to rise in a warm place until doubled in size, about another 60 minutes. Preheat oven to 400 degrees Fahrenheit. Take the 4 tablespoons of melted butter and brush over the proofed buns. Sprinkle with more Demerara sugar. Bake for 12-20 minutes until buns are golden brown and the sugar on top has started to caramelize. Allow to cool for about 10-12 minutes. Serve with butter & jam. Looks yammy! Thank you for sharing. You’re welcome, thank you for stopping by and commenting! Good photos and presentation! I always want to eat what you post! That compliment is very much appreciated Avery, I try really hard with my amateur food photography skills lol. Thank you! I doubt very many people would Marisa; thank you! Oh, they look so delicious, Jess! I would love to try making them! I hope you can, they’re really great buns. Thanks Julianna! Thanks so much, they’re VERY good and not too hard to make at all.